Schneider Electric is the global leader in energy management and automation, operating in over 100 countries with over 170,000 employees and selling BtoB and BtoC. They already have over 500 registered users of the BrightEdge platform. Fisher’s goal is to permeate SEO and content performance into every aspect of website ownership, development, and content creation, and to make SEO experts out of everyone who touches the site. “The transformation that I’m really trying to bring about is that today marketers are data scientists. If you’re not running your process by the numbers, it may not be an issue now, but you run the risk of being eclipsed by your competitors who are. One of the ways that we’re trying to run the business by the numbers is by making the numbers more easily available. We’ve worked closely with the analytics team to integrate everything into BrightEdge. We use dashboard features to automatically deliver this data in a really consumable format at regular intervals, which takes the pressure off a person to make reports and gives the task to BrightEdge to do it best.” See David's video. 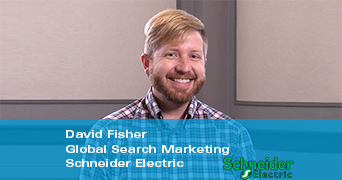 BrightEdge has really helped me elevate the SEO program at Schneider Electric to generate not just adoption but excitement.